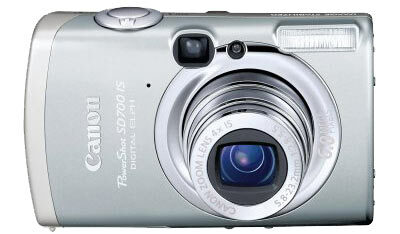 Photoxels has reviewed this digital camera from Canon, the PowerShot SD700 IS. The Canon PowerShot SD700 IS is Canon's first Digital ELPH equipped with image stabilization, which helps reduce camera shake and blurred images. Following the "Perpetual Curve" design first seen in the SD500, the Canon SD700 is beautifully and solidly built with an essentially silver body and chrome accents around the F2.8-5.5 lens, plus a practical black surface surrounding the extra large 2.5-in. LCD monitor. Its ultracompact dimensions earn it our JeansPocket™ Certified award, which means you can comfortably carry it in your jeans pocket.